The height of the plant can be quite variable ranging from 12 to 30+ inches (30 – 80 cm). 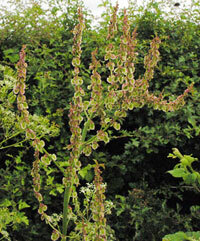 It tends to be fairly erect, with the higher leaves unstalked and ‘wrapped’ about the stem. The lower leaves (up to 6x as long as wide) are arrow shaped, and the two basal leaves point backward. 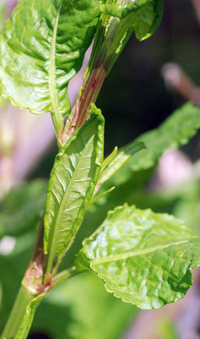 Where the leaves meet the stem (the leaf base) there is a tissue-like or sheath structure – the ochrea(e). The plants may be in flower in May through to August. The flowers are small and red collected together in leafless branched spikes. 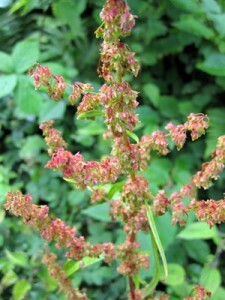 The male and female plants are found on separate plants. The petals and sepals of the flower are ‘indistinguishable’ and are referred to as tepals. There is an inner and outer layer; the inner ones are slightly larger. The fruit that forms is described as a three sided nut, they are small and brown when mature. 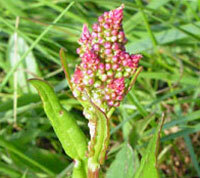 This is a plant of grassland, meadow and open woodland. It is a perennial, and can withstand cold temperatures. Sorrels and docks belong to the same genus; sorrels are generally smaller. The fruits are very important in the identification of the various species of Rumex. The flowers were once used to make a reddish brown dye for clothing, and the leaves had / have various culinary uses and were used in the making of poultices. Note : the leaves contain oxalic acid. Photography : most images - courtesy of ‘Wild Flowers of the British Isles’ : the images remain copyright of Peter Llewellyn.